Standedge Tunnels | Words, By George! The Standedge Tunnels are four parallel tunnels beneath the Pennines in northern England. Three are railway tunnels and the other a canal tunnel, located at the Standedge (pronounced Stannige) crossing point between Marsden and Diggle, across the boundary between the West Yorkshire and Greater Manchester conurbations. Before boundary changes in 1974, both ends of the tunnel were in the West Riding of Yorkshire. 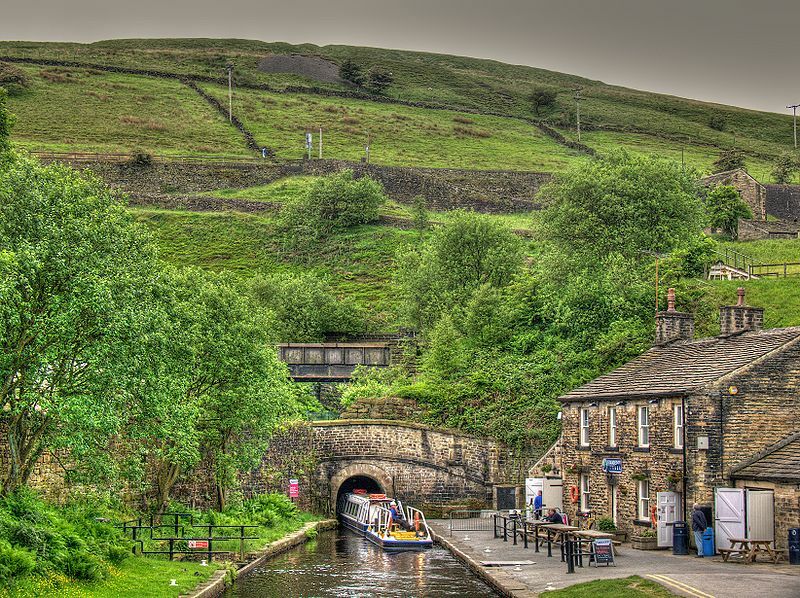 The canal tunnel on the Huddersfield Narrow Canal built between 1795 and 1811, is the longest (5.029 km) and oldest (1795), and holds the record as the longest and highest (1.9 km) canal tunnel in the United Kingdom. It is 1.94 km underground at its deepest point. All four tunnels are linked by cross-tunnels or adits at strategic intervals to allow the railway tunnels to be built quickly, reducing the need for construction shafts, as waste could be removed by boat. Of the railway tunnels, only the one built in 1894 is currently used for rail traffic. Closed in 1943, the canal tunnel was re-opened in May 2001. The Standedge Tunnel Visitor Centre, at the Marsden end a base for boat trips into the tunnel and hosts an exhibition depicting the different crossings. I did not get an opportunity to visit this tunnel complex during my recent return to the UK, but I am so impressed by this engineering masterpiece, it had to be entered here.